Beautifully furnished with modern decor, and warm alderwood and granite tile counter top finishes, the Winter Wren Loop Vacation Rental #2 in River Wild sleeps 10, one of the spacious four bedroom, three and half bathrooms vacation homes in River Wild that features four bedrooms, 3.5 bathrooms and a media room. Winter Wren Loop #2 is unique to any other River Wild vacation rental in the neighborhood as it has three levels, four bedrooms and a media room. Large King Master Suite is located on the main level, a large walk through closet and full on-suite bathroom with a shower and dual sinks. Guest King Suite #1 and Guest King Suite #2 has private entrance to "Jack and Jill" full bathroom and a desk for checking in while on vacation. Both Guest King Suites are located on the upper level. Guest Queen Suite features one queen bed and two sets of twin bunks and is located next to the media room, and located on the "ground" level of the home. The media room features a 65" flat screen LCD smart TV with DVD player and very comfortable sofa for cozy nights viewing your favorite shows and films. Large open and social floor plan makes this a perfect vacation rental to invite your family and friends. Fully equipped gourmet style kitchen with stainless steel appliances, 5 gas burner range, side by side refrigerator with ice and water, microwave and oven. The breakfast bar seats four and the kitchen is open to the dining area that seats up to 10. Cozy and comfortable living room furnished with two comfortable sofas and two reading chairs, a fireplace and a 43" flat screen LCD smart TV and DVD player. Spacious deck has patio furniture and patio dining table that seats up to 6, lounging furniture off of master deck and a natural gas barbeque grill near the kitchen door. 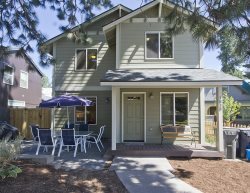 Perfect location for all that Bend Oregon has to offer and very private. Close to downtown for restaurants and night life or easy access to Phil's Trailhead for mountain biking during the summer and to Mt. Bachelor Ski Resort for winter fun! Easy access to the Old Mill District and Shopping Center, Les Schwab Amphitheater and Drake Park. Year-round seasonal outdoor recreation opportunities in Central Oregon for skiing, snowboarding, snowshoeing, cross country skiing, fly fishing, hiking, rock climbing, white water rafting, kayaking, lake kayaking, road, mountain biking and paddleboarding. Located right off of Century Drive which leads to Mt. Bachelor Ski Resort, several lakes and trails for mountain biking for skill levels ranging from beginner to advanced riding. River Wild in Mt. Bachelor Village Resort, Steps to Community Pool and Hot Tub! Pet Friendly with prior approval for dogs under 30 lbs only. Pet rent is $20 per night per dog.